The Australasian Health Infrastructure Alliance (AHIA) is a unique Australian and New Zealand public sector collaboration and was established in 2004. Formerly the Health Capital Asset Managers’ Consortium (HCAMC), AHIA comprises senior asset managers from the public health authority of each Australian state and territory and New Zealand. One of the key commitments of AHIA is to support industry organisations and member jurisdictions to better plan, procure and manage their health capital assets. AHIA is the custodian of the Australasian Health Facility Guidelines (AusHFG) which were first released in 2007. The Alliance works across Australia and New Zealand to bring together information, research and practical experience about developing and managing health assets and infrastructure. The accumulation of this knowledge contributes to the continuing evolution of the AusHFG and supports the development of best practice solutions for common issues in capital and asset management. Through the AusHFG and its member activities, AHIA proactively supports and builds the capability of the public health sector by providing facility design and other guidance based on evidence and industry and consumer collaboration. As a leader in health facility planning, AHIA can provide contemporary best practice resources to jurisdictions and service providers that is based on nationally shared knowledge and overseas experience. AHIA reports to the Australian Health Ministers' Advisory Council in relation to the development of the AusHFG and other matters concerning the planning, delivery and management of health assets. NSW through Health Infrastructure provides Secretariat support to AHIA. To contact the Secretariat please use the Give Feedback function of this site. 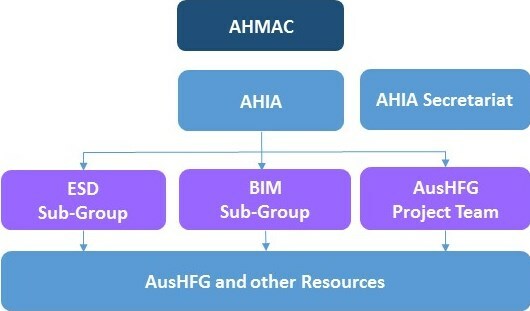 The AusHFG Project Team is based in NSW at Health Infrastructure and provides support to AHIA to co-ordinate the review and update of AusHFG resources. To contact the AusHFG Project Team please use the Give Feedback function of this site. AHIA members meet monthly to manage the review and approval processes for the AusHFG and other strategic matters relating to the industry. AHIA has formed a number of sub-groups that consider key issues such as environmentally sustainable design (ESD) and building information modelling (BIM). These groups act as knowledge sharing platforms and inform the development of AusHFG resources.